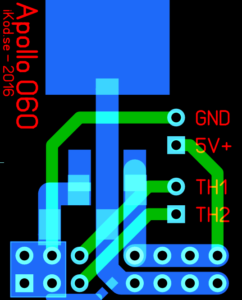 A while ago, a friend of mine asked me if I could help him to draw a Voltage Regulator for the ACT Electronic Apollo 1260/4060 cards. Unless you need to replace your current Voltage Regulator it is also used when you upgrade a Apollo card from 040 to 060. This is is because of that 060 used 3.3V compared to the 5V that 040 uses. A goal for this was not only to make a compact Voltage Regulator but also add two extra features such as a 5V header for a fan and also add an option to easy add a header for reading the Thermal Sensor in the MC68060. The result was the following. I used a 2 layer PCB design with a LDO, some Tantalum capacitors and the smallest component is a 100nF 0402 SMD Capacitor. I have been using Elecrow’s PCB service lately and they deliver good service and quality to a very good price. After around two weeks I got the PCB’s delivered and I made around 11 pieces to test and the result was very promising. All tests and also live tests showed that it was working. The final result after assembly was very nice and has extremely compact design. 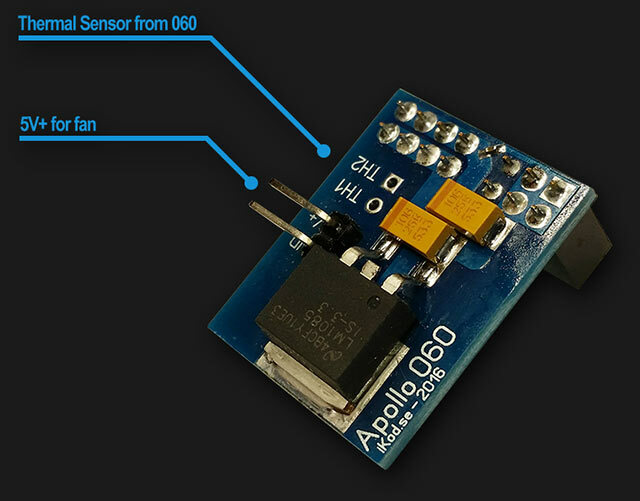 The Voltage Regulator was also able to handle 80MHz+ overclocking on the Apollo 1260 card with a 060 rev. 6 that I own. Later on I will write down and document a sample of how to use the Thermal Sensor-header on the Voltage Regulator. If you are interested in buying one of the Apollo Voltage Regulators, you can see my ad at Amibay here. Is this the same converter used on the apollo 3060 and 4060 ?